Here at Travefy, we love two things: Travel & Free Stuff. To celebrate these things, we’re excited to announce our Free Hotel Getaway sweepstakes. 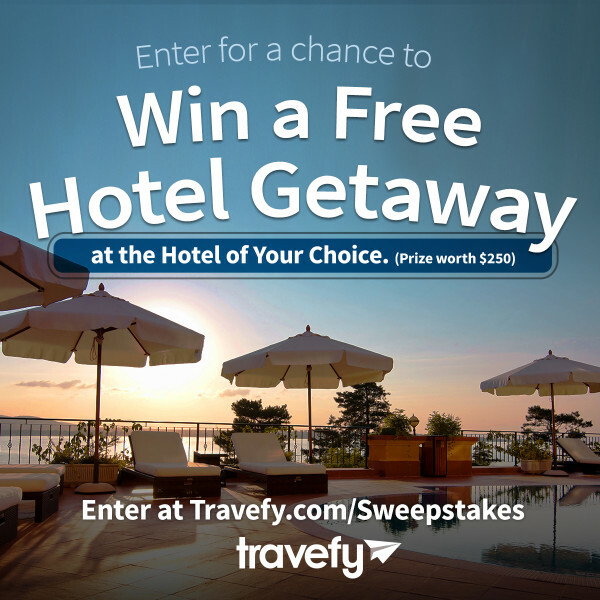 To enter for your chance to win a free hotel getaway simply go to Travefy.com/sweepstakes or click the below button. You can enter simply by sharing your email address or earn more entries by sharing this fun sweepstakes on social media. We’re giving away a FREE hotel stay at the hotel of your choice! That simple. Technically speaking, we’ll be providing you a $250 voucher for the hotel of your choice (that means anywhere in the world). As an update on our last exciting giveaway – the Spring Break Free Flight Giveaway – we’ve notified the winner and are excited to share with the world fun information on the winner and their chosen destination in the near future.